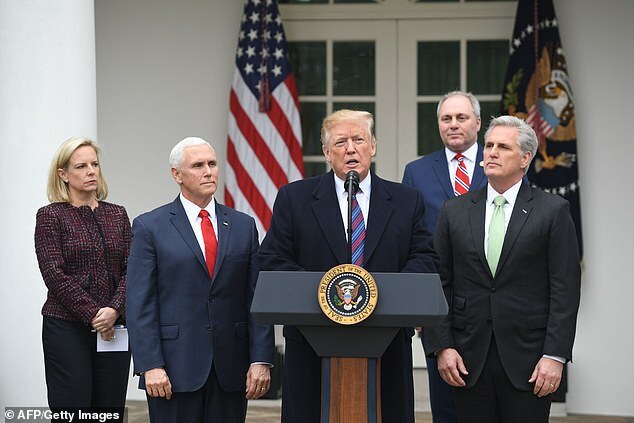 President Donald Trump told Congressional leaders Friday that he will shut down the government for ‘months or even years’ if he does not get money for his border wall with Mexico — and said he was ‘proud’ to do it because it’s the right thing. Trump’s threat was first disclosed by Chuck Schumer, the Senate minority leader, during a news conference outside the White House. He accused the president of holding federal workers ‘hostage’ for the wall and urged him to continue the conversation with the government open. The president confirmed the remarks as he addressed reporters in the Rose Garden. ‘I did. I did. I did say that. Absolutely, I said that. I don’t think it will, but I am prepared,’ Trump said at the beginning of a lengthy news conference. Trump claimed the meeting was ‘very, very productive,’ which was a stark contrast to the tone adopted by Democratic leaders, and said that he was setting up a working group led by Mike Pence, the vice president that would meet this weekend to discuss how to move forward on the shutdown. He headed to the Rose Garden after the meeting for an impromptu press conference flanked by Homeland Security Secretary Kirstjen Nielsen, Pence, Republican Minority Whip Steve Scalise and Republican Minority Leader Kevin McCarthy. Mitch McConnell, the Republican Senate leader had been present for the talks but was not at the press conference. Trump claimed he was ‘busy running the Senate,’ even though it had adjourned until Tuesday. Trump described his wall as a vital national security measure, and in a free-wheeling performance claimed that illegal immigrants were being driven across it away from ports of entries, in some cases with women in the back of their vehicles with their mouths taped over. He said he’d prefer to do it through a ‘negotiated process’ with lawmakers, and that’s what they will be working on over the weekend. He also used the press conference to say that he had asked the Democrats if they would use the shutdown to impeach him. Schumer, Pelosi, their deputies and their Republican opposites had met with Trump at the White House for two hours of talks with Trump as the shutdown went on for a fourteenth day. Trump insisted that ‘progress’ was made — although he wouldn’t say what it was — and that both sides were in agreement on reopening the government as quickly as possible. As Pelosi left the White House she told reporters the talks were ‘sometimes contentious. Schumer echoed her comments. ‘It is very hard to see how progress will be made unless the open up the government,’ he said in brief remarks. The Democrat said Trump indicated in the meeting that he was willing to ride the shutdown out. ‘He said he would keep it closed for a very long period of time, months or even years,’ Schumer added. There was no mention from the Democratic leaders of a possible deal floated by Pence, who had suggested that the president could use a program giving legal status to illegal immigrant children as an incentive for Democrats to give him is border wall. Trump claimed at the presser once again that an appeals court squashed a DACA deal last year when it protected the program his administration axed. The president said that the $25 billion over 10 years that the legislation appropriated only provided $1 billion up front for his wall and he didn’t want to have to go back to Congress and ask for the money each year. He signaled he wouldn’t sign the bill he seemed to be referring to at the time because it provided a pathway to citizenship for illegal immigrant children. He smacked it down as amnesty for illegals. Pelosi has said that DACA alone is not enough for her caucus to give the president his border wall funding, anyway. He’s asking for north of $5.6 billion at this point. The president didn’t say what he offered Democrats, or what they may have agreed to, as he took one last shot at getting the government back on track before the end of the current pay period. He used the response as an opportunity to say that the nation does not want children dying on the way up from Central America to the United States and traveling in caravans. Trump meanwhile sent each Member of Congress a slideshow prepared Nielsen that the White House previously suggested was so sensitive that it could only be viewed in a classified setting. It was not clear why the presentation needed to take place in the Situation Room of the White House if the information could be distributed far and wide. It is usually used for classified meetings. It didn’t come up at the president’s press conference, where a congresswoman’s calls for his impeachment and a pay raise his Cabinet members were due to receive were also discussed. He made sure he had the last word on Friday, giving an impromptu press conference in the Rose Garden on an unseasonably warm winter day. The temperature was 50 degrees Fahrenheit in Washington during the remarks that Trump wore an overcoat to. His vice president, accompanying lawmakers and DHS secretary signaled toward the end that they were cold. Trump offered his jacket to a shivering Nielsen but she declined and rubbed her hands together, instead, as the president forged on with questions. He let House McCarthy and Scalise deliver remarks after Pence and had Nielsen take a question on terrorism. As they were leaving, Pence turned around to tell DailyMail.com that he’d reject a pay raise coming to him as an unintentional effect of the shutdown. Democrats also spoke to press from the president’s driveway, reiterating in their position that they will give him no money for the wall. But the California Democrat has continued to be firm in her resolve that wall funding is not coming.